7 Where Do We Draw the Line? 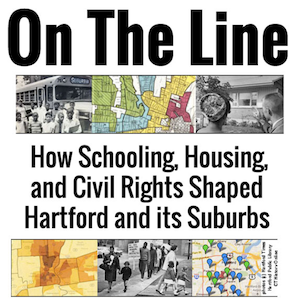 On The Line makes visible the hidden boundaries that divide metropolitan Hartford, Connecticut, and tells the stories of civil rights struggles to cross over, redraw, or erase these lines in schooling and housing. On The Line tells the story of schooling and housing boundaries that shaped American metropolitan life over the past century, and also the civil rights struggles of families and activists to cross over, redraw, or erase these powerful lines. Set in the city of Hartford, Connecticut, and its emerging suburbs, the book explains how this metropolitan area became one of the most racially and economically polarized regions in the northeastern United States. The story highlights how government, business, and white middle-class families drew lines to distance themselves from others, and the evolving coalitions that have sought to reform the relationship between private housing and public education. This digital-first book was designed for the open web. The narrative is wrapped around digital evidence—including interactive maps, videos, and documents—to make hidden boundaries more visible, and to amplify the voices of people who challenged these lines. On The Line is best read in your web browser, where readers may fully explore the evidence, follow links to related sources, and connect with the author and other readers through comments. In addition to the web edition, the same text (with static images and links) also appears in the downloadable e-book versions, and an inexpensive print edition to come. In an open-access book, history becomes more widely available to the public, without barriers of price or permissions. As educators, we believe that knowledge becomes more valuable when it is easily discoverable and accessible, not hidden behind password-protected paywalls. Moreover, the liberating power of history—and civil rights history in particular—should be freely available, especially for the communities of people who lived these stories. Anyone may freely read this book online or download it from the web, and after it is completed, purchase or borrow a low-cost paperback edition. Written for the liberal arts, the book blends interdisciplinary scholarship with highly-engaged student learning. It draws on the fields of history, social sciences, and policy analysis in urban America, and more than a decade of collaborative research with undergraduate students, faculty, staff, and community partners at Trinity College. Rather than simply report our results, we describe our discovery process, so that others may expand upon, or even challenge our findings, in future works. We also strived to explain new concepts and make the text accessible for younger students and residents of the Hartford region. In sum, On The Line blends the best aspects of conventional publishing and web innovation. The main narrative still looks and feels like a scholarly book, divided into chapters and backed up by endnotes. But the web platform allows us to embed digital evidence on the page, and to link directly to external resources located elsewhere. As a result, this book delivers a more comprehensive, coherent, and connected work of scholarship than what was previously possible in print-only publications, or scattered online journal articles and blog posts, at no cost to the reader. Flip the page—in whatever format you prefer—and find out for yourself. Jack Dougherty, the lead author of On The Line, is Professor of Educational Studies and Director of the Center for Hartford Engagement and Research (CHER) at Trinity College. He collaborates with students, colleagues, and community partners to explore cities, suburbs, and schools in metropolitan Hartford, Connecticut, using data visualization, digital history, and web writing tools. Contact him on his faculty profile page, or follow him on Twitter or on his blog. Jasmin Agosto (Trinity College Class of 2010 with bachelor’s degree in American Studies and Educational Studies) co-authored Mobilizing Against Racial Steering and Redlining, and also researched 18th-19th century school documents, and decades of school residency cases. Richelle Benjamin (Trinity College Class of 2015 with bachelor’s degree in Educational Studies and Hispanic Studies) researched school residency cases and conducted oral history interviews. Ilya Ilyankou (Trinity College Class of 2018 with bachelor’s degree in Computer Science and Studio Arts) developed several interactive maps in this book. His open-source code and map links are available at our GitHub public repository: http://github.com/OnTheLine/. Vianna Iorio (Trinity College Class of 2019 with double major in Educational Studies and English) co-authored Restricting with Property Covenants, Jumping the School District Line, and other chapters TO COME. Katie Campbell Levasseur (Trinity College Class of 2011 with bachelor’s degree in Educational Studies and Mathematics) conducted restrictive covenant property records research and co-authored How We Found Restrictive Covenants. JiYun (Lisa) Lee (Trinity College Class of 2017 with bachelor’s degree in Educational Studies and Psychology) co-authored Jumping the School District Line. Shaun McGann (Trinity Colege Class of 2014 with bachelor’s degree in Political Science and Urban Studies) co-authored Federal Lending and Redlining. Candace Simpson (Trinity College Class of 2012 with bachelor’s degree in Educational Studies) co-authored Who Owns Oral History? A Creative Commons Solution and conducted oral history interviews on restrictive property covenants and Sheff v. O’Neill. Tracey M. Wilson (Trinity College Class of 1976) co-authored Restricting with Property Covenants. See related chapters in her 2018 open-access book, Life in West Hartford,(http://lifeinwesthartford.org). University of Connecticut Libraries Map and Geographic Information Center (MAGIC) Staff and students at MAGIC co-created the Google interactive maps for this book, with support from a National Endowment for the Humanities grant in 2010-11. Data Visualization for All (with contributors), book-in-progress, http://DataVizForAll.org. Web Writing: Why and How for Liberal Arts Teaching and Learning (co-edited with Tennyson O’Donnell). Ann Arbor: University of Michigan Press, 2015, http://WebWriting.trincoll.edu. Writing History in the Digital Age (co-edited with Kristen Nawrotzki). Ann Arbor: University of Michigan Press, 2013, http://WritingHistory.trincoll.edu. Read the text in any format below. But this digital-first book (with interactive maps, videos, and source links) is best experienced in the web edition (http://ontheline.trincoll.edu). Several images will not appear in the PDF/ePUB/MOBI/DOCX versions until after this book-in-progress is completed. To cite this book-in-progress, please refer to the web edition (rather than pdf or ebook editions), since this online version is easiest for all readers to access instantly. Jack Dougherty and contributors, On the Line: How Schooling, Housing, and Civil Rights Shaped Hartford and Its Suburbs (Trinity College, book-in-progress, 2018), http://ontheline.trincoll.edu. Dougherty, Jack, and contributors. On the Line: How Schooling, Housing, and Civil Rights Shaped Hartford and Its Suburbs. Trinity College, book-in-progress, 2018. http://ontheline.trincoll.edu. Dougherty, Jack, and contributors. On the Line: How Schooling, Housing, and Civil Rights Shaped Hartford and Its Suburbs. Trinity College, book-in-progress, 2018. Web. http://ontheline.trincoll.edu/. To cite a specific passage, insert the author/title/web address of the relevant chapter as a “book section” in your preferred citation style. Since the web edition does not include page numbers, rely on the URL to point to the specific page. Elaina Rollins, Clarissa Ceglio, and Jack Dougherty, “Writing Greater Hartford’s Civil Rights Past with ConnecticutHistory.org,” in On The Line: How Schooling, Housing, and Civil Rights Shaped Hartford and its Suburbs (Trinity College, book-in-progress, 2018), http://ontheline.trincoll.edu/. What if web links break? All past and present editions of On The Line include the stable web address (http://OnTheLine.trincoll.edu), which redirects readers to the current version of the book. The web edition of the book also includes internal links to different pages within the book (e.g. selected chapters, bibliography, etc.) If any internal links break, this platform has been set up to automatically redirect readers to the book’s home page. The book also contains external links (such as endnotes that refer to other articles, books, or websites). If any external links break, each endnote contains a full citation and external web address, which readers may search in the “Way Back Machine” at (http://archive.org) to see the most recent version of this site. Donate to the Internet Archive, the non-profit organization that maintains this valuable collection of our digital history as a free public service. On The Line is an open-access, born-digital, book-in-progress by Jack Dougherty and contributors at Trinity College, Hartford CT, USA. This work is copyrighted by the authors and freely distributed under a Creative Commons Attribution-NonCommercial-ShareAlike 4.0 International License. See exceptions for specific items noted as copyrighted by others and included here under fair-use guidelines. Our GitHub open-source repository (https://github.com/ontheline) contains all of the source code for the book (including images, data, and interactive charts and maps), and is freely shared under an MIT license. Learn how to work with GitHub and create your own charts and maps in Data Visualization for All (http://datavizforall.org) by Jack Dougherty and contributors. You may re-use and modify our work, as long as you follow the terms above, and include a source credit to: OnTheLine.trincoll.edu by Jack Dougherty and contributors.